A couple of colleagues in Dallas recommended Gemma as a new, hot restaurant serving great cuisine. 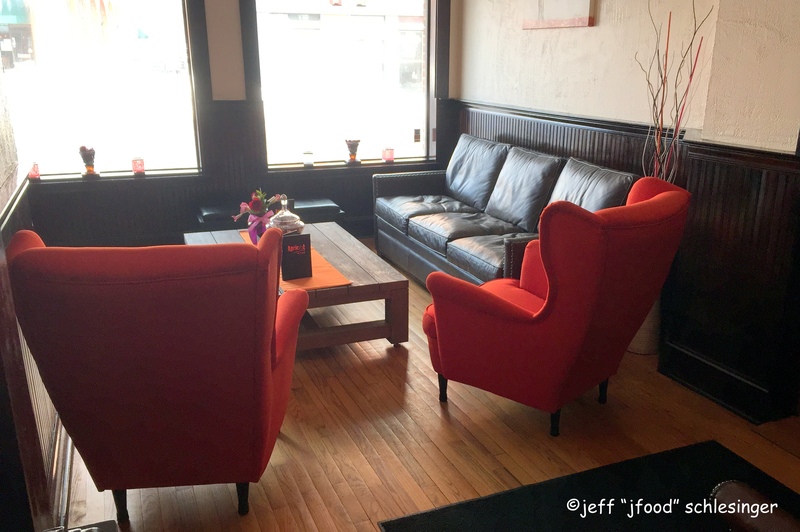 On my recent trip, the three of us grabbed a reservation and headed to 2323 North Henderson to see if the food equaled the hype. The restaurant is located in a strip mall in a gentrifying neighborhood, but when you enter the single dining room with a long bar along the left wall, the interior is warm and light, filled with blues, whites and chandeliers dangling by nautical ropes from the ceiling, you are transported to a more relaxed environment. The server was outstanding from our first interaction until we left over two hours later. He gave a brief overview of the philosophy with all food sourced as local as possible and if not available, California. The owners, Allison Yoder and Stephen Rogers returned to Rogers’ home town of Dallas from the Napa Valley where Rogers was the Executive Chef at PRESS. He now oversees Gemma’s kitchen, while Yoder handles the front of the house. And if our experience is any indication, both are doing a fantastic job. As a small group of foodies, we wanted to taste as many items as possible so we decided to order three appetizers to share. The first was the ROASTED BABY ARTICHOKES, which were topped with a poached farm egg, a Provençal vinaigrette and accompanied by wild arugula. The artichoke sections were soft, sweet with just a touch of earthiness from the roast, while the poached egg brought a creaminess to the presentation. The highlight was the chef’s variation of a traditional Provençal vinaigrette…he included capers for additional tang and saltiness. The wild arugula added a peppery component. 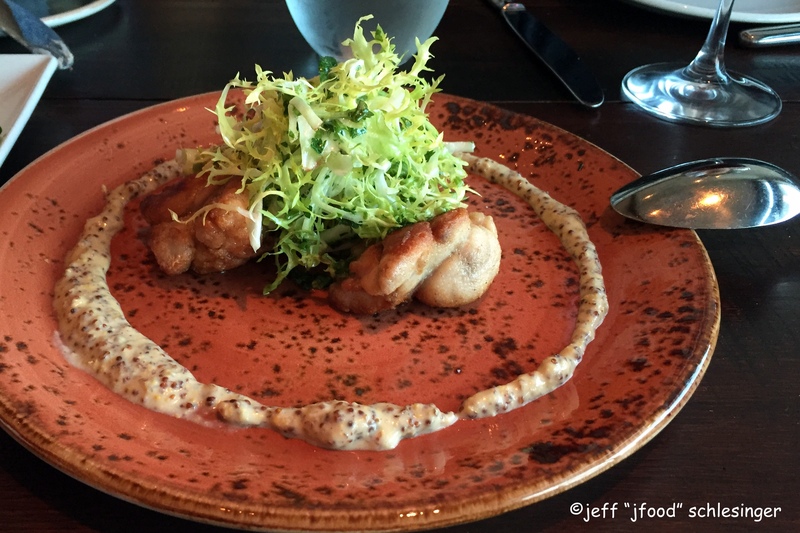 The CRISPY VEAL SWEETBREADS were served with frisée and encircled with whole grain mustard. Three large pieces were perfectly sautéed to deliver the described crispy exterior and the dense texture of the interior. The mustard was a delightful complement to the sweetbreads and the frisée lightened the dish with a clean crispiness. The third appetizer was a half-order of the RICOTTA CAVATELLI. The restaurant recently changed the meat from wild boar to braised lamb. 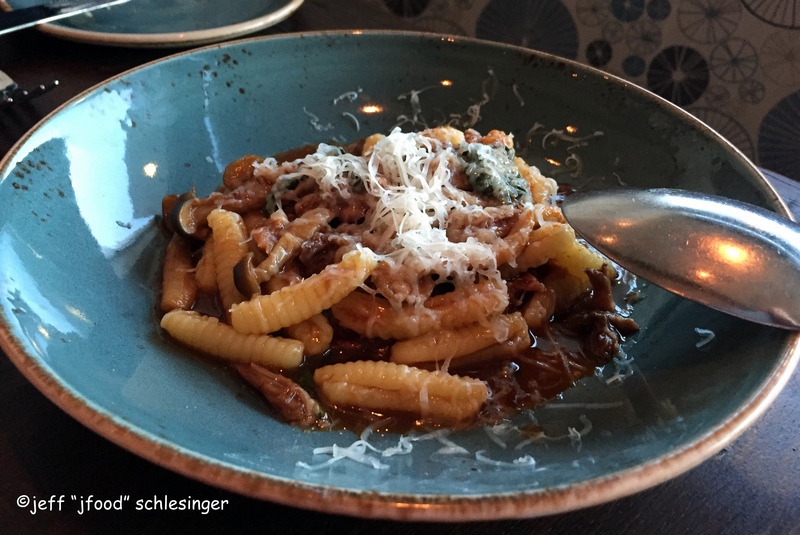 The house-made cavatelli was cooked to al dente and when paired with the richness of the meat was fantastic, and included a bit of grated cheese atop the pasta that added just a bit of saltiness. For my entrée I ordered the BRAISED VEAL CHEEKS. Accompanying the cheeks in the cast iron skillet were Tokyo turnips, baby carrots, Cipollini onions, bacon, black pepper spätzle. This dish was outstanding. The cheeks were braised until they just held together, incredibly tender and rich, while the texture was soft and succulent. The cheeks were accompanied by amazing vegetables…my favorite were the Cipollini onions, with a pungency sweetness that complemented the beef. The carrots and turnips both added more crunch and additional sweetness. All of these ingredients sat atop crispy spätzle, which was light and delicious. I was not a fan of the bacon, its saltiness and smokiness were overwhelming harsh to the other ingredients. We ordered two sides to share. The first was the MAITAKE MUSHROOM that were seasoned with shallot, garlic, and thyme. These were not your ordinary sautéed mushrooms. Several stems of these soft and mild maitake mushrooms danced on the palate, offering just a touch of earthiness. On the other hand the KENNEBEC FRENCH FRIES were ordinary and somewhat disappointing. They were basic French fries. The kitchen was not finished with tantalizing our palates. Desserts brought another round of brilliant dishes. My favorite was the APPLE TART with toasted pecan butter, apple cider caramel, and a little butter pecan ice cream. The tart began with an ultra-buttery dough, filled with perfectly baked apples and then the caramel and ice cream added a wonderful level of sweetness. Close behind the tart was a delicious BASQUE CAKE, which was served with Meyer lemon cream, and a frozen citrus soufflé. The citrusy combinations started with the moist and luscious cake and finished with the cream and soufflé. The last dessert was the CHOCOLATE CARAMEL PINENUT TART, served with toasted marshmallows and a scoop of vanilla bean ice cream. This dish suffered from sitting next to the other impeccable desserts. There were too many components that fought with each other and did not present a harmonious combination. 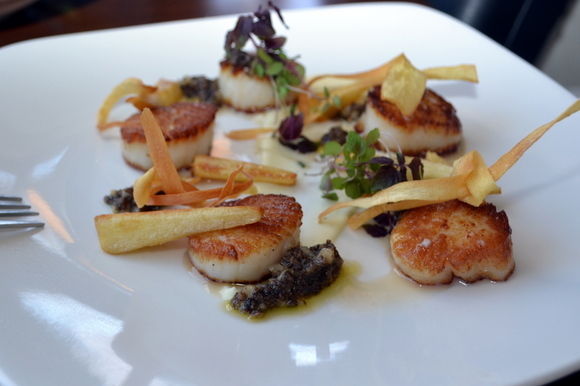 Overall, Gemma is serving outstanding and creative cuisine in a warm and inviting setting. 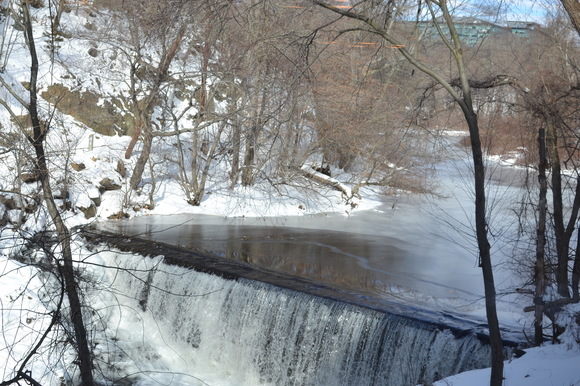 This is definitely worth a return visit. Apricot Bar and Grill recently opened on in Norwalk next to Fat Cat Pizza. The building has an interesting and storied history with numerous bars and several adventure-based occupants. With its narrow and deep interior, the current owners divided the space into three sections. The front is a “lounge” with a sofa in front of a fireplace place two wing chairs. The mid-section houses the copper-topped bar with 10 bar stools, two HDTVs, a selection of 12 basic bottled beers, 12 smaller brewery bottled beers and five beers on tap. The drafts currently include Samuel Adams Winter Lager, Half Full Brewery, Long Trail Ale, Yuengling Lager and Miller Lite. The rear offers a more traditional setting with table cloth covered tables for thirty-nine guests, plus four booths. For my Sunday venture I ordered the HOUSE BURGER, an 8oz. 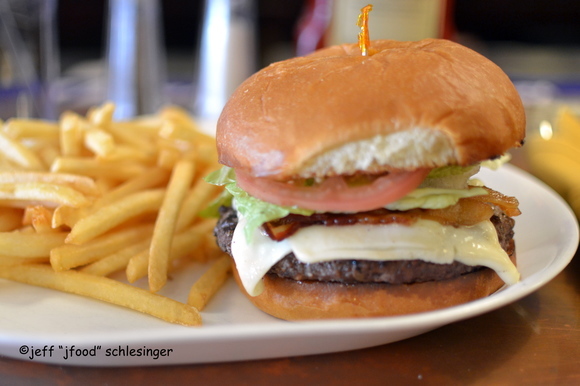 patty of Certified Black Angus Burger, American cheese, and lettuce & tomato, served on a brioche roll. I requested bacon and was offered either regular or sweet potato fries, I chose the former. When the burger arrived it looked fairly ordinary. 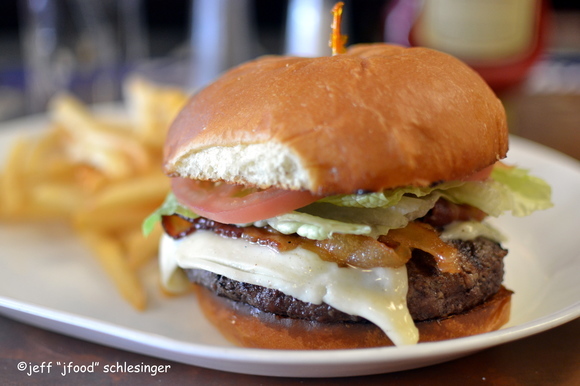 There was a little juice from the patty seeping into the bottom bun, the cheese was half-melted and a thin tomato and iceberg lettuce sat on the cheese. The fries looked like they were plopped out of a plastic bag into a fryer and dumped on the plate. 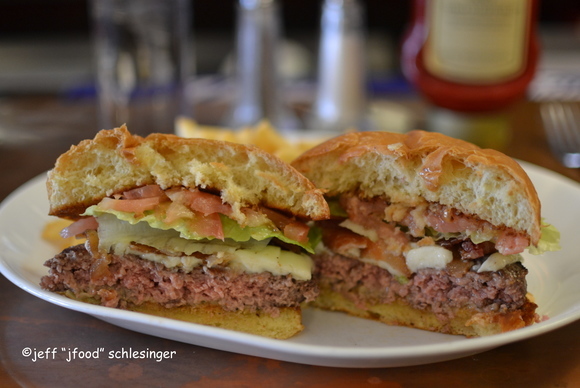 I cut the burger in half and I have to admit it was prepared perfectly to medium-rare. I tasted the meat, it had decent flavor, was medium compressed and maintained the grind of the meat. The bacon was nicely cooked to deliver just a touch of saltiness but was very basic. The tomato and lettuce were ordinary and the cheese was nothing special. The “brioche” was a more a grocery store bag bun. The kitchen did butter and griddle the bun for a nice buttery goodness with a good crunch. Other than the meat this was basic in all other aspects. The ketchup was also disappointing. It was Sysco’s “House Recipe” brand. This was an immediate turn-off, and the taste was more vinegary than Heinz, which is my preference. Overall this is an assembly of basic ingredients. 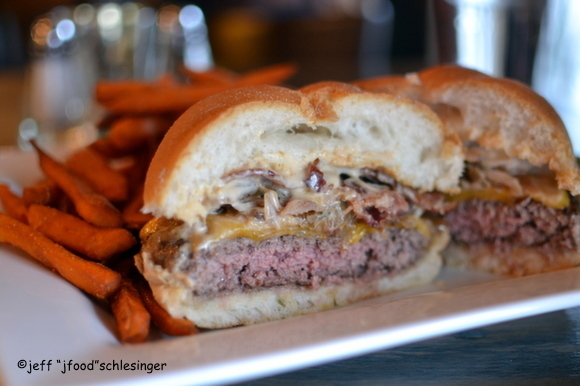 The kitchen did an excellent job in preparing the patty and toasting the bun. But their hands were tied from the ingredients and they did the best they could. Mediterraneo, a ‘destination restaurant’ in the Hotel Zero Degrees on Main Street in Norwalk is a beautiful backdrop for Executive Chef Albert DeAngelis’ culinary tour of the Mediterranean. The aquatic inspired dining room features a large bar area to the left, with several high top tables to augment the bar seating, and to the right is the main dining room. With hardwood floors, white chairs and a large nautical flag painting along the far right wall, the dining area presents a clean and airy feel. The highlight of the room is the floor to ceiling glass wall that overlooks the panoramic, million-dollar waterfall view on the river. From a magnificent French Braised beef “Bourguignon” to a mild Tuscan Prosciutto wrapped rabbit loin to an outstanding Wild black sea bass, the menu at Mediterraneo offers wide varieties of clean flavors and combinations. Mediterraneo is one of five local restaurants owned by the Z Hospitality Group. Chef Albert joined Z Hospitality Group as Executive Chef in 1989 and is the creative vision behind the group’s five Mediterranean-style bistros. By the time he graduated from the Culinary Institute of America in 1986, he was already a veteran of the kitchen. His tenure began at the age of 16 and his career included stints at Tropica, Chez Josephine, and Taliesin in Manhattan as well as at Hotel Le Goyen and the two-star Michelin restaurant Gérard Besson in France. Z Hospitality recently invited CTbites to sample Chef Albert’s new menu at Mediterraneo. The chef prepared a wide variety of appetizers, entrées and desserts. 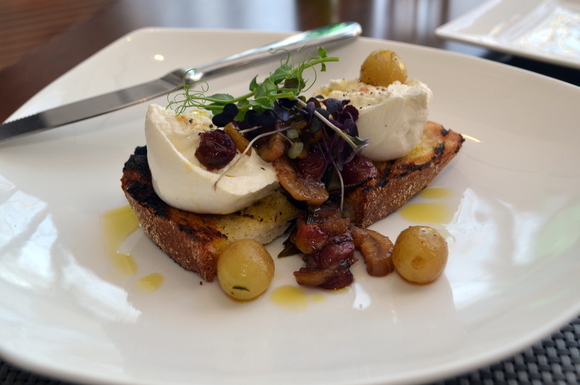 My favorite appetizer was the Maple Brook Farms Burrata served with roasted grapes and chestnuts sitting atop slices of grilled country bread. 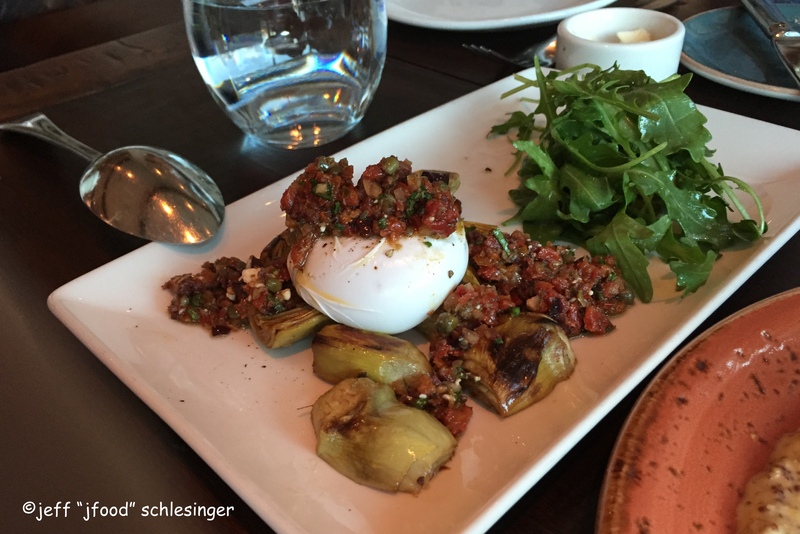 The Burrata was halved to expose its creamy interior and was delicious with the sweetness of the roasted grapes. The chestnuts added a wonderful nuttiness to the dish and just a hint of saltiness. 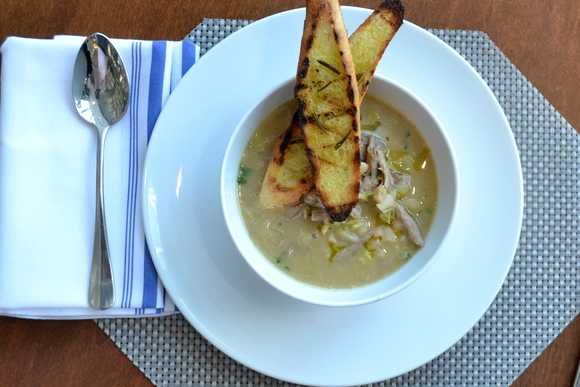 The White Bean Soup included chunks of duck confit and savoy cabbage, served with two slices of toasted rosemary crostino. The al dente beans retained their bite and was accentuated with the deep, richness of the moist and tender duck. The savoy cabbage offered a touch of crunchiness. 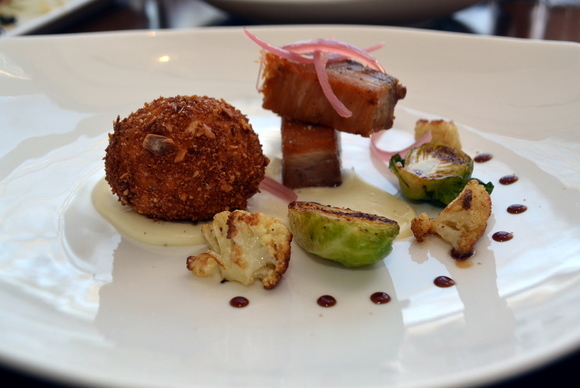 The Hazelnut Crusted Egg was accompanied by a mini-tower of crispy pork belly topped with thinly sliced pickled onions and a few sections of roasted cauliflower and Brussels sprouts. The pork belly was the highlight; it was moist and the slivers of pickled onions were a fantastic complement to the pork. The Brussels sprouts and cauliflower brought an earthiness and a crunchy component. The Charred Spanish Octopus was served with shaved fennel, Taggiasca olives, blood orange segments, and drizzled with sherry vinegar. The four, small sections of the octopus were a little tough in texture and slightly under-seasoned. The orange and olives were a good additions but the fennel lacked flavor. 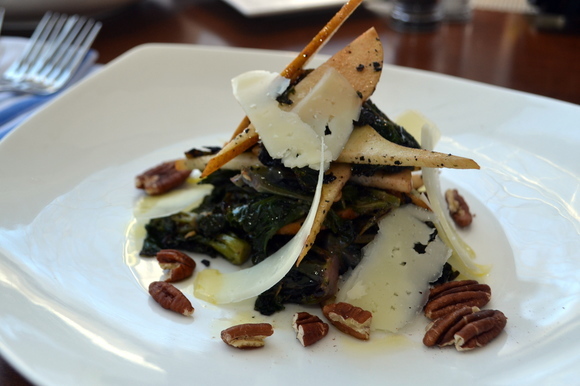 The Grilled Kale Sprout Salad paired Bosc pear, roasted pecans and Manchego cheese with a date vinegar. There was a slight sweetness to the pears and the Manchego Cheese was delightful with its subtle nuttiness. As much as I liked the taste of the kale sprouts, it was overcooked and overdressed. 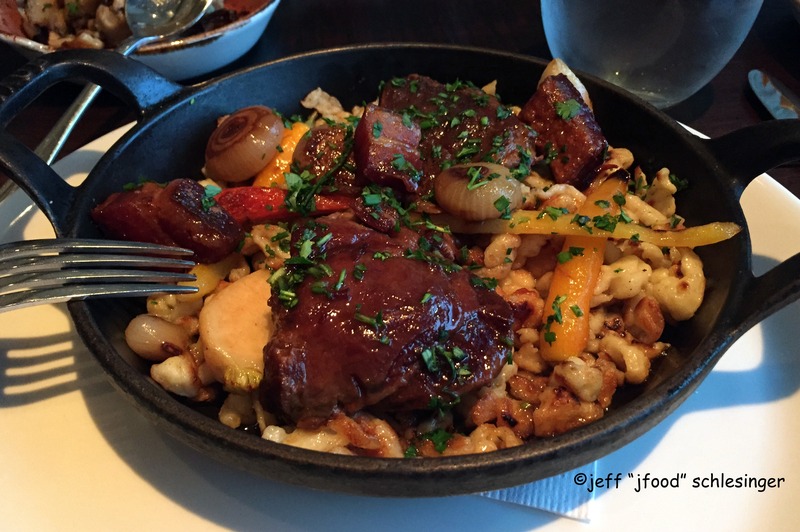 My favorite dish of the entire visit was the Braised Beef “Bourguignon” served with roasted vegetables, cremini mushroom caps over crispy spätzle. It was delicious and may be the best Bourguignon I have ever tasted. 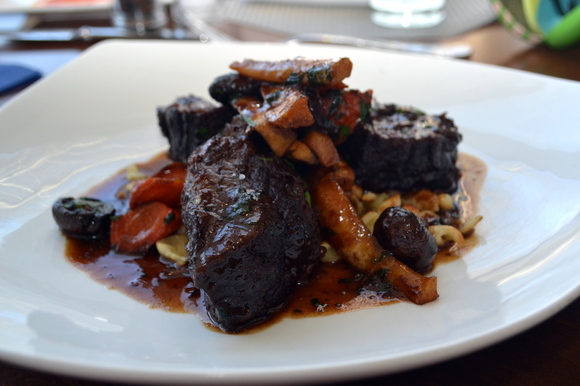 The dish included three, boneless short rib sections, braised in red wine and served with carrots, crisped Brussels sprouts, cremini mushrooms and served over crispy spätzle. This deep, rich combination of the ingredients was superb. The beef was soft and tender, absorbed the full body of the wine and was perfectly offset by the sweet carrots. The mushrooms brought a touch of earthiness and the spätzle added a light crispiness to the dish. 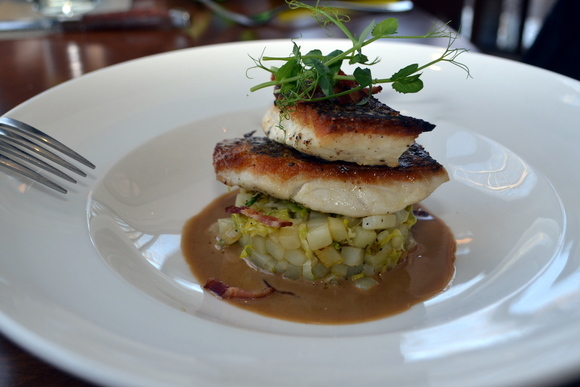 Another outstanding entrée was the Wild Black Sea Bass, served atop a potato and Brussels sprouts hash, bacon, all nestled in a pool of a reduced balsamic / garlic sauce. The two large fillets were flawlessly prepared, with ultra-crispy skin while maintaining a moist interior. The hash was delicious and the smoky-salty bacon was fantastic. The sauce was phenomenal; rich, flavorful and beautifully complemented the other ingredients. 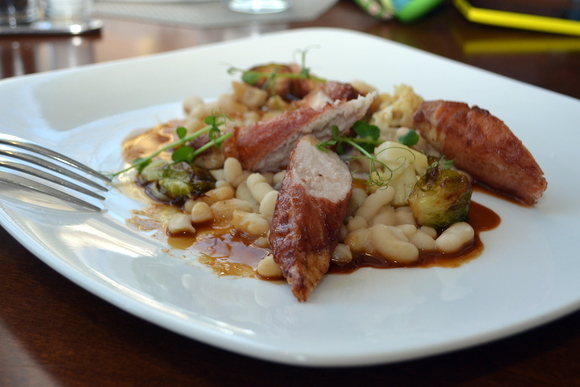 The Prosciutto Wrapped Rabbit Loin was served atop white beans, Brussels sprouts in a pool of rosemary au jus. The saddle of Rabbit was wonderfully moist and tender and the prosciutto delivered a slightly crisped and salty exterior. The beans were served al dente and the Brussels sprouts conveyed a bit of earthy qualities. The rabbit jus was finished with a bit of garlic and rosemary. 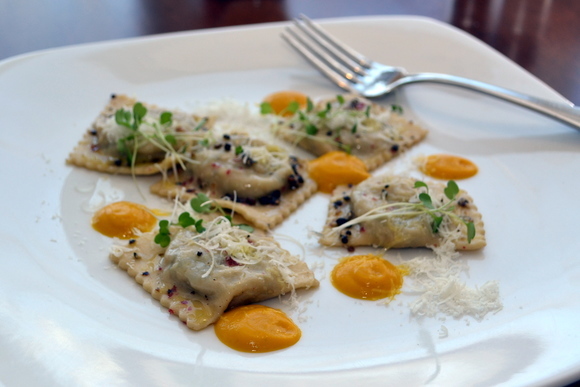 Of the two raviolis, I really liked the Braised Pork and Lentil Ravioli which was served with dollops of carrot purée, shredded Pecorino cheese, and cracked pepper. The pasta was thin and delightful. The pork filling was rich in flavor and the cracked pepper added a little spiciness. The carrot purée was a delicious complement to the richness of the pork. I was not as fond of the Scallop and Roasted Cauliflower Ravioli, which was served with fresh thyme butter and toasted almonds. The texture of the scallop filling was more a mousseline, which was slightly off-putting. We enjoyed three desserts. The Tiramisu was accompanied by dollops of chocolate and crème Anglaise. 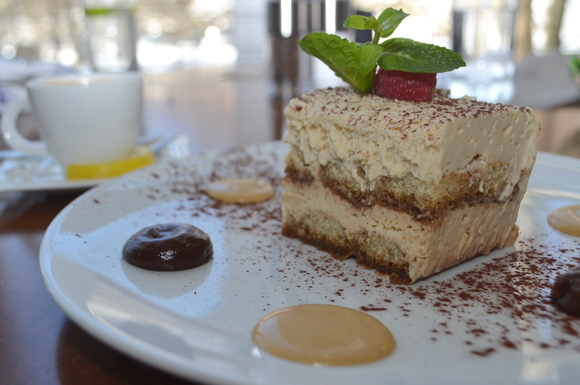 The luscious texture of the cake and creams were lightly accented with the liquor in the tiramisu. The second dessert was a Tuscan Boule Bread Pudding with a caramel sauce. This version was outstanding but I found it a little dense and heavy. The last dessert was a Chocolate Molten Cake, served with pistachio gelato. 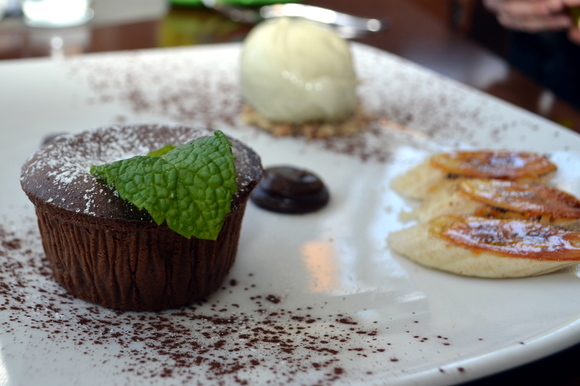 Mediterraneo’s version is a mild chocolate, with the interior oozing on the plate and complemented by a mild pistachio gelato and the caramelized banana slices. 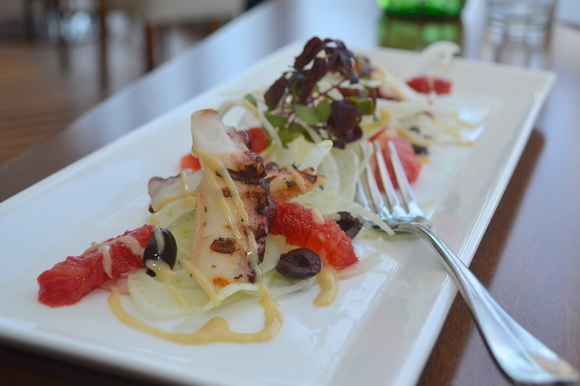 Overall, the new menu at Mediterraneo includes some exceptional choices. 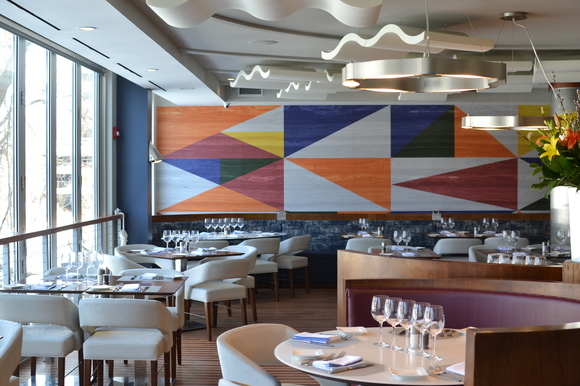 With five restaurants stretching from Rye to Westport that include Aurora (Rye), Mediterraneo and Terra (Greenwich), Sole (New Canaan), Aqua (Westport) and Mediterraneo (Norwalk) Z Hospitality Group and Executive Chef Albert DeAngelis are delivering the cuisines of southern Europe. 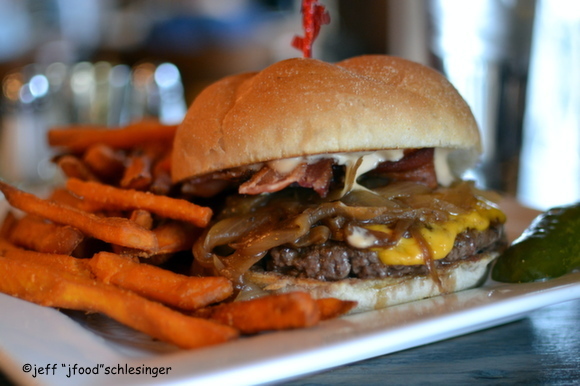 The third location of the Little Pub chain in Fairfield County is located on Route 1 in Cos Cob a mile west of the I-95 exit. Upon making a left into the parking lot, you are asked to valet park your car, the staff told me it gets “pretty crazy” at night. The exterior reminded me of a European country escape and the interior transports the guests to a northern European atmosphere with a large floor to ceiling stone covered two-sided fireplace with a smiling hooded character embedded above the hearth. Cast iron chandeliers hang from the ceiling and the walls are exposed woods to the vaulted wood ceiling, further enhanced by large wooden beams. The windows contained diagonal cross-bars and the floor is large planked reclaimed wood. The main dining room seats 60 guests with the bar offering an additional 10 bar stools and twelve seats at high-top tables. I was in the mood for a burger and the menu contained ten pre-determined burger combinations. I chose the “Steakhouse,” medium-rare served with thick cut smoked bacon, caramelized onions, melting cheddar and a swath of steakhouse mayo, and opted for the sweet potato fries as my side. When the plate arrived I tasted a few fries and was disappointed. They were bland, with no flavor or seasoning. I cut the burger in half and noticed that it was cooked more medium-well than medium-rare. My first bite continued the trend, there was no seasoning and it was highly compressed, losing all its juiciness. The onions tasted more boiled than caramelized. The bacon was well prepared and offered a touch of saltiness and the mayo added a little spiciness from the horseradish. The bun was a basic Kaiser. I checked my notes from my visit to the Wilton location from two years ago and had the same reaction. We are both consistent. The burgers at Little Pub are just not to my liking. 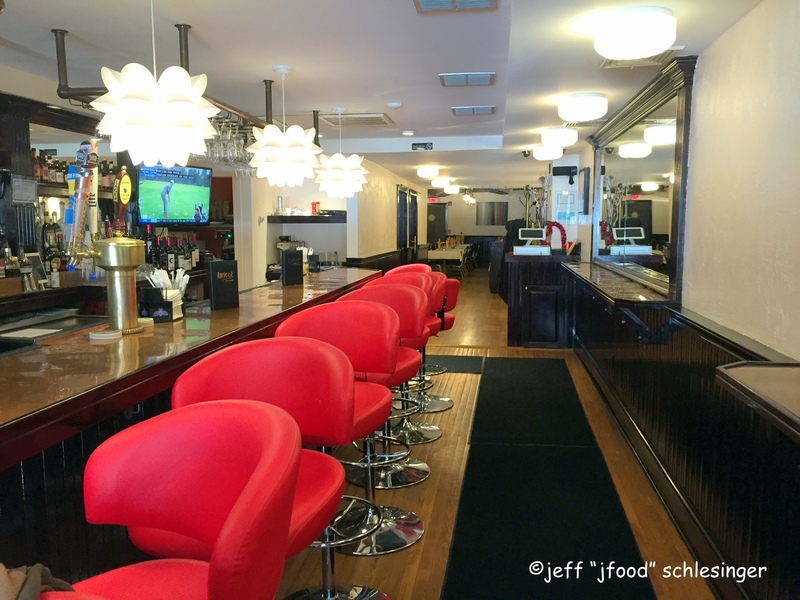 Novita is located a few doors east of South Park Avenue on East 22nd. You step down a couple of steps to enter the restaurant with the main dining area to the left and an alcove dining area directly in front. A long bar occupies the area immediately upon entering. The main dining area is packed with tables, they are incredibly close together; two people can barely pass simultaneously. The alcove has two banquettes and two tables for two guests. We were seated in the alcove. It has its pluses and minuses. It is a bit less noisy but the quality of service is noticeably lacking, almost an afterthought to the staff. There were several times I needed to look for our server. If you would like to feel that you are part of the vibrant restaurant scene, ask for the main dining room. For my appetizer I ordered the “Caprese,” one of the specials for the evening, and for my entrée I ordered the “gnocchi con stinco d’agnello” described as gnocchi with slow-braised Jamison Farm lamb shank. The Caprese contained slices of tomato, a Burrata round that was halved and a sprig of basil. Bottles of Balsamic and Olive oil were brought to the table and I drizzled the salad with each. Visually the kitchen did not seem to care. The Burrata was more hacked in half than sliced, the tomato slices were haphazardly cut and the basil was thrown on top. The Burrata was OK. There was far too much exterior and the creaminess that you desire from the interior was scant. The tomatoes were good, nothing special and the basil was full of flavor. The gnocchi was delicious. The ricotta gnocchi were soft, well prepared with just a hint of ricotta. They were topped with an incredibly delicious lamb ragu. The meat was tender and rich in flavor and the deep flavors of the lamb was a perfect complement to soft, pillowy texture of the gnocchi. My one complaint was the amount of lamb, it was minimal and I wish there was more. Service was spotty. I almost felt we were assigned the “kids’ table.” The server checked in rarely and I needed to call for him whenever we needed something since we were out of eyeshot. Overall I enjoyed Novita. The next time I would ask for a table in the main dining area so I do not feel for $75-100 per person we are being punished.